Time to give back to the profession I love! 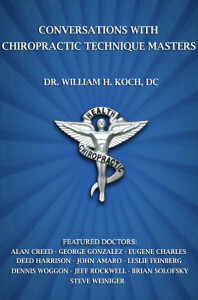 Chiropractic has been my love and passion for 50 years. I love being a DC and feel blessed to have had this great profession that has given me such a wonderful, fulfilling life with material success and the joy and satisfaction of not just helping people, but of changing lives. Now I want to give back to my profession. I have a deep desire to share what I have learned during my half century of experience. So I will now be spending more time on my other two passions: writing and teaching. While I plan to continue to take care of my patients as long as I can, I want to be able to reach more people and help more patients than I can possibly take care of myself. Helping other DCs to learn and grow professionally will allow me to have a positive impact on not only the doctors but also their patients. I want to share my expertise and experience with the younger generation of DCs, to help them help more people and enjoy the kind of success I have experienced. I would especially like to be able to help young chiropractors or students about to graduate. I want to help them become the very best doctors they can be. I would like to be able to help them with the transition from student to physician, to mentor them in a way that will help clarify any confusion, focus their career goals and to teach them some of the technique refinements that I have acquired and perfected over almost 50 years of practice. Many of these young docs will be starting their careers with a huge debt burden in the form of college loans. And if they want to start their own practice, they face all the expenses of starting a new business, which could mean taking on a lot more debt. It can be daunting to get out in the world with the desire to start a practice when the costs involved in doing so can be so high. Getting deeper in debt is never a good idea, but in today’s economic climate it is especially scary. The politics of healthcare and the new and constantly changing state of the insurance industry create more and more uncertainty, and make it harder and harder to plan and to know how to proceed. I want to share my personal philosophy of practice and my own business model, which I think, could really help with many of these issues. I do not believe starting a practice needs to be exorbitantly expensive. I am a strong advocate of getting back to the basics – to what made our profession succeed and grow in the first place: great technique practiced by a skilled and “patient focused” doctor in a very personalized way with the goal of getting great results quickly. And I believe this kind of practice can be successfully established with very little overhead and without taking on a huge debt load. Among the things I want to share, is how I have practiced very successfully for the past fifteen years with only a flat bench or massage table, SOT blocks and ArthroStim and VibraCussor electronic adjusting instruments. This means that a recent graduate with the proper skill sets can set up their own practice and do great work with a minimal amount of start up expense. I want to help pave the way for new docs, smoothing the road they travel, helping them avoid the bumps, potholes and pitfalls by sharing my own experience, my mistakes and my solutions for success. My goal, and the purpose of this website, is to guide you, shorten your learning curve help you achieve just that.